Situated in the heart of The Rocks, The Russell Hotel is within walking distance of Museum of Contemporary Art and Circular Quay. Also nearby are Sydney Opera House and Sydney Harbour Bridge. The hotel features a warm character and original 1887 architecture, giving it a real sense of home and quaintness in a city with some of the most contemporary architecture in the world. The hotel features 29 rooms in total, each with their own style and feeling. This charming historical hotel offers a lobby, TV lounge, breakfast room and laundry service. The hotel offers a bar/lounge. A complimentary breakfast is available. Wireless Internet access is complimentary in public areas. Additional amenities include a rooftop terrace, a library, and laundry facilities. For a surcharge, guests have access to a shuttle from the hotel to the airport (available on request). This is a smoke-free property. The Russell Hotel in the Rocks is a Tourist hotel. Located in City Centre area. Shopping is accessible by bus/taxi and the nightlife/restaurants are located in the hotel. 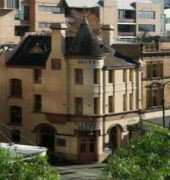 Descriptionclass="small" style="text-align: justify; font-size:11px;">Situated in the heart of The Rocks, The Russell Hotel is within walking distance of Museum of Contemporary Art and Circular Quay. Also nearby are Sydney Opera House and Sydney Harbour Bridge. The hotel features a warm character and original 1887 architecture, giving it a real sense of home and quaintness in a city with some of the most contemporary architecture in the world. The hotel features 29 rooms in total, each with their own style and feeling. This charming historical hotel offers a lobby, TV lounge, breakfast room and laundry service. The hotel offers a bar/lounge. A complimentary breakfast is available. Wireless Internet access is complimentary in public areas. Additional amenities include a rooftop terrace, a library, and laundry facilities. For a surcharge, guests have access to a shuttle from the hotel to the airport (available on request). This is a smoke-free property. Great Customer Service in a historic, quaint, traditional, friendly hotel/pub style. Quaint traditionally appointed rooms, a welcome place to rest after a busy day exploring The Rocks and Harbour. Our favourite place to stay when we have attended concerts at Darling harbour and Opera House. Customer service was excellent. 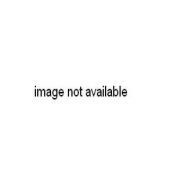 Great value for money due to the central location. Highly recommended. Great location and comfy room. The hotel was very conveniently located, just few minutes walk to the Sydney Harbour. Room with king bed was clean and very comfortable. The shared bathroom was at easy reach with all amenities and were unoccupied each time we needed to use it. We only stayed one night and were away for most of the night, therefore are not sure if the pub downstairs was noisy. But from midnight onwards there was no sound, other than just the street noise. We had a very pleasant stay and plan to book this hotel again in our future trips to Sydney. We stayed in one of the smallest rooms with a shared bath. It was fine. The place has much more character than the large, chain hotels nearby. The Russell is very close to many of the most popular destinations, and we accessed the city bus, train, and water taxis within just a short walk. The employees were very helpful throughout our visit, and breakfast was appreciated each morning. We also enjoyed the sitting areas (a living room with tv and library and a balcony over the street adjoining this space). This hotel is a gem! The staff is incredibly helpful and professional. The rooms are comfortable, attractive, and quiet. Ours had a nice view of a park across the street. We did have an air conditioner in the room. 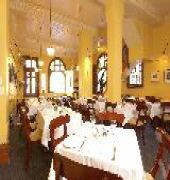 The location is excellent with lots of good restaurants and a market on the weekend. It is very close to the cruise terminal. They stored our luggage until we could check-in. The continental breakfast in the charming restaurant/bar is simple, but adequate. There was no in-room safe, but the office would put passports, etc. in theirs. We spent a long weekend at the Russell from Brisbane to see a show at the Sydney Opera House (so we were looking for a place within walking distance of the SOH). 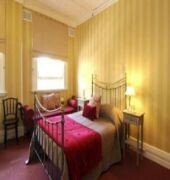 I chose the Russell via one of the on-line booking sites, based on TripAdvisor reviews. That worked efficiently and email communication from the Russell was good. We had a room with private facilities. Make sure you get what you want when booking - some rooms have a shared bathroom separate to the room. Our room was very nice. Quite spacious. Comfy bed. The weather was good so the absence of air-con didnâ€™t bother us. The room had a ceiling fan and the window opened. Thereâ€™s a flat screen TV, hanging space, bedside tables and good free wifi. The bathroom was an enormous wet room. The location was excellent - we caught the train from the airport to Circular Quay (you can tap on and off using a credit card without buying a transit card), and it was a 5 minute walk to the Russell. Itâ€™s one block back from harbourside. Being where it is, thereâ€™s plenty of restaurants, coffee shops and attractions (SOH, Sydney Harbour Bridge, Circular Quay ferries, the city, the Rocks, weekend markets, etc) nearby. Itâ€™s a lovely building too. Thereâ€™s a pub downstairs, which is where a serve yourself breakfast is set up - coffee/tea (also available in your room), juice, cereal, yoghurt, hard boiled eggs, toast, etc. Next time Iâ€™m looking for accommodation in Sydney, Iâ€™ll look at The Russell first.